Sony's NWZ-A818 flash-based MP3 player holds up to 8GB of music and video, and has superb audio quality — without requiring any advanced adjustments. Built with style and function in mind, the NWZ-A818 competes directly with Apple's iPod Nano. The NWZ-A818 has a 2-inch QVGA (240-by-320-pixel) TFT colour display, comes in either a black or a silver case, and weighs 2 ounces. Supporting .aac, .mp3, .wav, and .wma files, the unit can play music for about 30 hours on a full charge. Instead of using its own software, for advanced management of music and playlists, the NWZ-A818 syncs perfectly with Windows Media Player 11 (a copy of the program is included with the player). More advanced users will enjoy the player’s ability to accept music and videos introduced by dragging and dropping. Although Sony bundles a brief instruction manual with the NWZ-A818, navigating the A818 with the four-way main control button and dedicated 'option' and 'back' buttons is intuitive. The menu interface is straightforward and responsive, too. With just one hand, you can easily shuffle songs and search for photos or videos. However, putting the hold button on the back of the player wasn't the most inspired design decision. In lab tests, the Sony NWZ-A818's signal-to-noise ratio (where a higher number means a cleaner signal) was 75 dB, landing it just behind the Samsung YP-P2 (76 dB) and the Creative Zen (77 dB), but well behind the 89 dB turned in by the SanDisk Sansa Connect — the best fit for audio purists. In true Sony fashion, this MP3 player uses a proprietary 22-pin connection to establish a USB link to your computer. I wish that the company had used a standard USB connection, as many of its rivals do. Another design flaw is the short length of the headphone cord. The headphone cable is about 18 inches long but comes coupled with an adapter that provides another 21 inches, making a total of 39 inches. In comparison, Apple's iPod headphone cord is about 46 inches long. Although I found the cable-and-adapter arrangement annoying, the audio quality that the supplied ear buds produced was superior to any bundled headphones I've tried. When I tested the player on a flight, I could drown out the sound of the plane's engines by cranking up the volume. Overall, the 8GB Sony NWZ-A818 delivers impressive sound quality through its excellent (though strangely short) supplied ear buds. Navigation is intuitive, and the battery life is long. 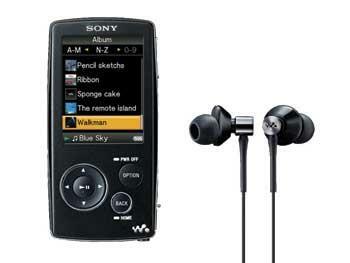 Customers looking for an alternative to Apple's iPod Nano should give this Sony MP3 player serious consideration.